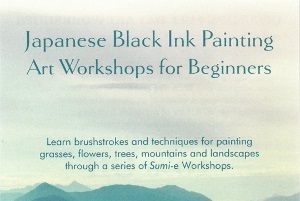 Sat 21st Jan: One-day Workshop €75.00. Sat 21st & Sun 22nd: Two-day Workshop €140.00. 9.30am – 5.00pm with one hour break for lunch. Tea and biscuits supplied. Please bring your own lunch. (Alternatively, light lunches are available at the cafe on the first floor). Advance booking is essential as places are limited. This entry was posted on January 7, 2017 by waterfordarts in Art, crafts, General and tagged black ink workshop, coastguard cultural centre, japanese black ink painting, workshops tramore.